Another summery bracelet…! Hope you like it. 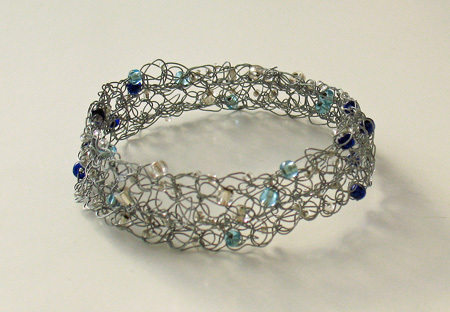 Beatuful bracelet, I have always wanted to try wire corchet – but so many ideas and so little time. One more for my ever growing “to do” list. I know, but it is nice to change material sometimes. Wire crochet is a bit hard on your hooks and hands though so I only do small projects. Oooo pretty! I tried wire crochet but couldn’t seem to get the starting and ending to work without looking like I just kind of mashed the ends together. Still attempting it… add to that long list of WIP’s a HEEEEYOOOGE box of beads. I mean huge. They’re just everywhere. That is beautiful! I’d like to try wire crochet too… maybe it’s a good choice for a future theme? I’ve done these before and i;ve leant the book to someone and they can’t find it. Can you help please.